Hawthorn (Crataegus oxycantha) has been clinically demonstrated to prevent free radical damage to heart tissue and the cardiovascular system. It has also been shown to improve the efficiency of the heart by increasing blood supply to the heart muscle. Hawthorn also has the ability to inhibit angiotensin-converting enzyme (ACE), which is associated with increases in angiotensin II, a potent vasoconstrictor. As a result, the heart is able to pump more blood through the body, and circulation to the extremities is improved through lowered resistance to blood flow in peripheral vessels. 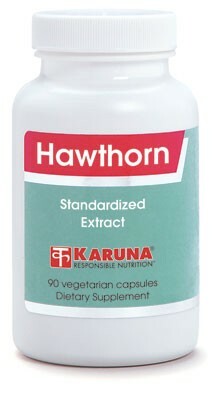 Hawthorn exerts a gentle, measured effect on the heart and circulation, resulting in improved cardiovascular function. Hawthorn's flavones increase contractions of the heart muscle, making it a more effective pump (Herz Gefabe 1993;11:516-24; J Cardiovasc Pharmacol 2000;35:700-7). Hawthorn reduces resistance in coronary and peripheral blood vessels and improves blood and oxygen flow to myocardial muscles (Arzneim-Forsch Drug Res 1967;17:490-1; ESCOP Phytotelegram 1994;6:20-6). Hawthorn has antioxidant properties and has been demonstrated to prevent free radical damage in heart tissue (Planta Med 1994;60:323-8; Arznei-mittelforschung 1997;47: 821-825). Numerous clinical studies have shown the ability of Hawthorn to support healthy heart muscle function, cardiac blood supply, and exercise tolerance (Cochrane Database Syst Rev 2008;(1):CD005312). Suggested use for adults: One capsule three times a day, or as directed.